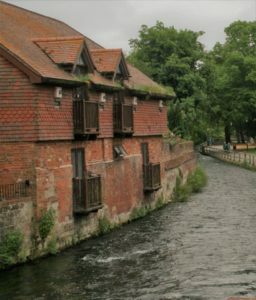 Winchester is rich with pages of history and novels from the Iron Age to Jane Austen. William the Conqueror began building Winchester Castle and today a centuries-old rendition of King Arthur’s Round Table hangs in all that remains – the castle’s Great Hall. 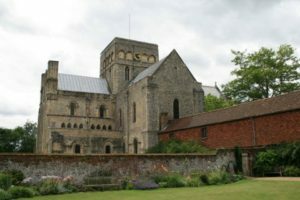 Roman artefacts are still ploughed up on surrounding farm land, while beneath the flagstones of the 1000 year old Winchester Cathedral Jane Austen is buried. 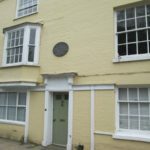 Although she lived and wrote in Hampshire, Jane Austen spent only the last months of her life in Winchester. When she died 200 years ago in 1817 only four people attended her funeral. Persuasion and Northanger Abbey were published after her death. Because of family connections I can’t visit the UK without taking the hour’s trip by train from Waterloo Station to Winchester. Winchester is a walking city. The River Itchen burbles through, home to white swans drifting and trails of watercress stretching in the clear water. Beside the river are the water meadows that so entranced Keats he wrote his ode To Autumn. If you walk along the meadows you come to the Hospital of St Cross, not a hospital in the modern sense, but a place of compassion and hospitality: an almshouse established in the twelfth century by William the Conqueror’s grandson for those who were struggling to survive. Even today visitors can request the Wayfarer’s Dole: a small glass of ale and piece of bread, reminiscent of the time sustenance was given to travellers. 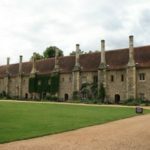 In the Tudor era the buildings of the Hospital of St Cross were extended and today some 25 Brothers, men over 60, live at this oldest charitable institution in England. Anthony Trollope is said to have based his novel, the Warden (a volume of the Barchester Chronicles) on a corrupt Master of the Hospital. And in this ancient city reality meets modern fantasy: small parts of the 600+ year old Winchester College were used in the filming of Harry Potter. It’s a city that has something for everyone. Another great post, Diana. I find your posts always take me to the place you write about. I’m very much enjoying your lovely blog posts on unusual and surprising places, Diana. So glad you like them, Corinne. If you’re ever in England do try to include Winchester in places you visit.